High Temperature DC-DC Converters | VPT, Inc.
Building on a proven hybrid converter design heritage, the HTD Series of high temperature DC-DC converters is specifically designed for harsh and extreme temperature environments including downhole oil and gas, MWD/LWD and wireline logging tools, aircraft engine electronics and other industrial applications. 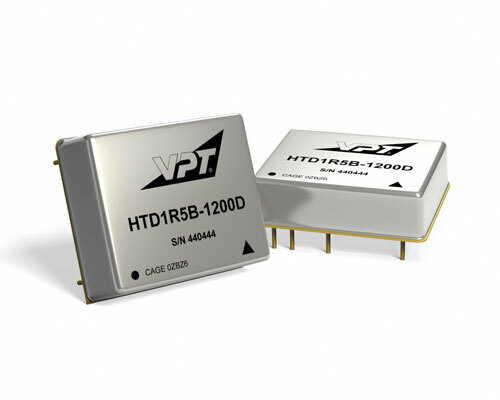 The HTD Series utilizes thick film hybrid microcircuit technology that provides superior reliability in high temperature applications. Bare semiconductor die are integrated with passive components using thick film conductors on a ceramic substrate. Component attach and die bonding are optimized for high temperature life, and the hermetic metal package protects internal components for long term reliability. High temperature performance is guaranteed through qualification, component testing and analysis. The HTD Series has been characterized over the full operating temperature range from -55°C to +185°C, including electrical performance, operating life, temperature cycling, mechanical shock and vibration. Custom versions are also available.